So imagine how ashamed I should be when all I can think of is how on earth do I get an internet connection? Don’t get me wrong, British-Indians lead the technology revolution. Ofcom’s 2013 Communications Market Report (CMR) says as much. Indians in Britain report the highest broadband take-up, even for those over 35. It’s true we, my heritage is Indian even though I am fiercely British, love our gadgets. And we start young and have multi-digital-devices. All these attributes are borne out in India. All the sellers of digital equipment I’ve met are aged between 18 and 30 and are highly qualified. It’s a young person’s market. Unlike Britain no-one queues, so the trader is dealing with as many as five customers at a time, keeping everyone happy. It’s a sight to behold. But unlike Britain, if you’re buying digital equipment for the first time, it takes an age and layers of bureaucracy to get something as simple as an internet dongle. You need your passport; you need to fill in forms; you need to have your photograph taken; and then you need to wait for forty-eight hours. After that you need to phone the service provider who asks you some security questions. If you pass the battery of tests you need to wait a few more hours, as many as eleven, before you’re finally connected. Once you’re connected accessing the internet is dirt cheap. My dongle costs the equivalent of £15 and I get 10GB for free. In Britain I pay £10 per month for 3GB. What doesn’t surprise me about the CMR findings is that Indians aged between 16 and 34 are seven times less likely to watch television than others in Britain. 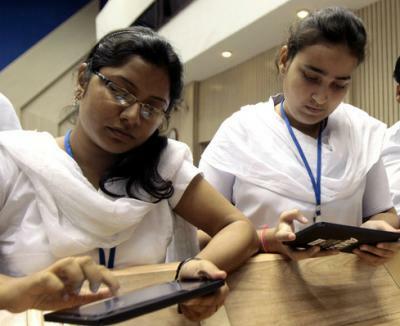 My personal experience, among my extensive network of British-Indian friends and family, especially my teenage daughter, is that they’re probably watching on their mobile phones, laptops or tablets. They choose what to watch and when to watch it. The appointment to view is no longer there. Ofcom will publish the results for Black Minority Ethnic groups in greater detail soon. I’m not entirely sure what questions have been asked. If I could, I’d ask some of my own. For example, I’d like to know how many only watch Sony, Zee TV or BEN TV and why. I’d like to find how many non-BMEs avoid watching the main terrestrial channels so I can compare and contrast. I’d like to know whether my hypothesis, that for many BMEs, British TV doesn’t provide the programmes or news they want to watch, is true. I say this because of one simple observation: in Leicester, where I live, as many as 250 different languages are spoken in the city’s schools, according to the 2011 Schools Census. So how can Britain’s broadcasters ever hope to capture their attention? Why is the CMR important, especially when interrogating the BME communities? It will tell us more about their listening, reading and viewing habits. The information is a goldmine for businesses. Anyone wishing to capture this lucrative and, in my mind, relatively untapped market, could do worse than analyse Ofcom’s findings. Submitted by Bill Dutton on Tue, 20/08/2013 - 10:26.